demonstration – Just Stop and Paint It! Perhaps I should have confessed it up front to Elizabeth, but I had had never been in an art classroom in an institution of higher learning. I have been in art classrooms at art schools, but never a college or university. Being primarily self taught the last 45 years of painting, my art comes from what I love. The only ‘formal’ instruction I have had is various workshops from artists I admire the last 15 years. 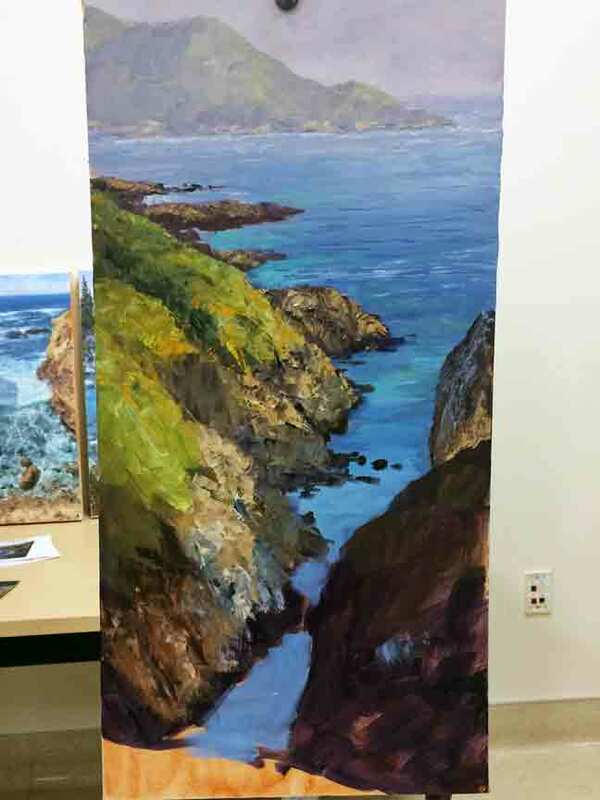 Elizabeth Blau, an art instructor at Ohlone College in Fremont saw me on a TV segment NBC Bay Area (you can watch it here if you missed it), so invited me to her painting and drawing class to talk about “The Creeks and Rivers of Silicon Valley”, and a painting demo. It was a class of about 10 students, all pursuing different disciplines. After a short talk about “The Creeks and Rivers of Silicon Valley”, we launched into a demonstration painting. 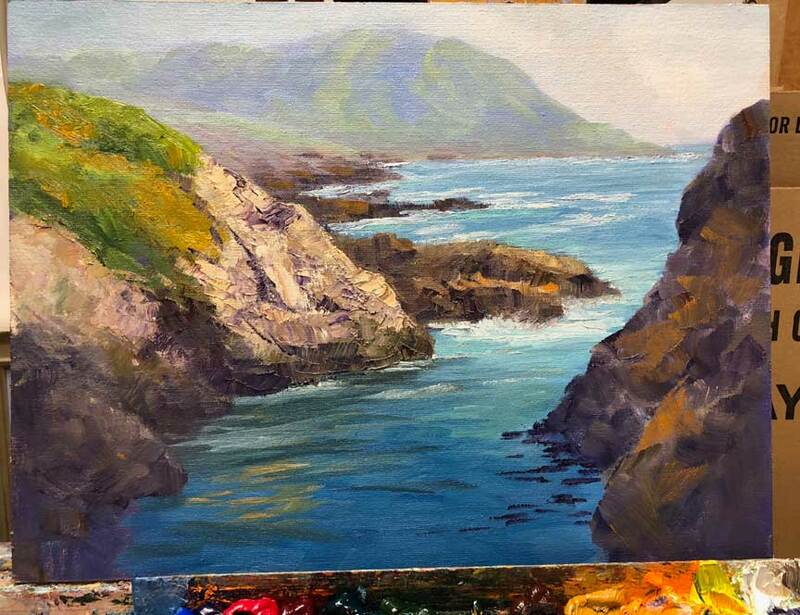 I chose a seascape in Garrapata State Park for my study. I really enjoyed the intimate setting where students scooted up right around my easel to watch me paint. The painting about where I left it in class. I touched up the painting a bit after returning to my studio which can be seen at the top of this weblog entry. 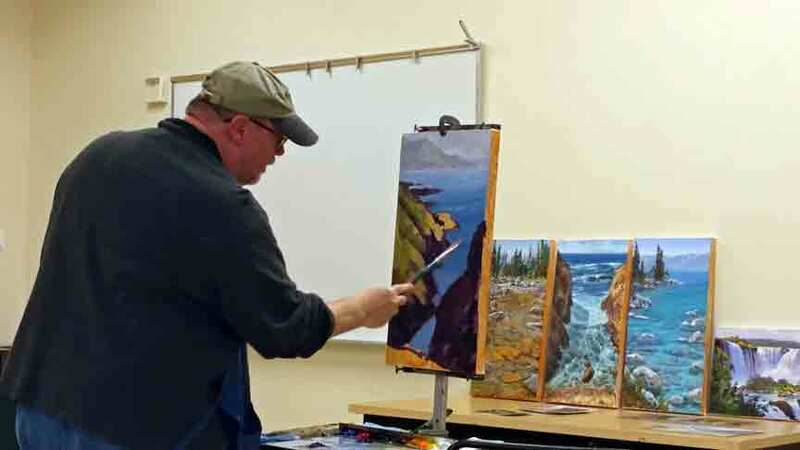 The Cambrian Artists League invited me for an ‘encore’ demonstration last Saturday. I had previously done a demo for them several years ago, and they wanted more. I did a snow scene for the last demo, and they wanted a seascape this time. I chose as my subject a scene from Perkins Park in Pacific Grove, CA. In the spring, the ice plant blooms there and the entire park is covered in a blanket of reds, pinks, and purples. I had painted there last year for the Carmel Art Festival, and in fact lately have been doing a painting in the park for the festival every year as they always sell. I have wanted to do a larger studio piece of the same scene. Thanks, Cambrian Artists League! It was a fun morning with a lively bunch of artists! I later finished the piece in the studio, pictured above. As usual, a painting is never completely finished until it goes out the door, but will set it aside for now. Enjoy this short video of a 90 minute demo I did for the Society of Western Artists reduced down to about two minutes. After watching this, it seemed I was turned around talking to the audience as much as I was painting! You can also read about this demo and a revolutionary new painting technique on my weblog here. The story starts at a demo I did for the Society of Western Artists in San Bruno, CA, last Saturday. I never thought in a few hours I would discover a new painting technique not heard of before. Four years ago I did a demo for them of a snow scene along the Truckee River and they wanted me to do another snow scene. 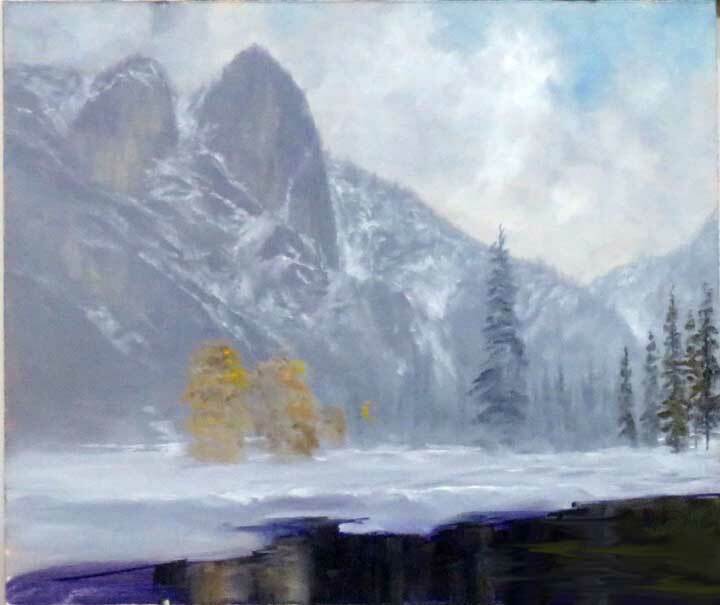 I had recently been doing a number of miniature paintings for the holiday season, and a number of misty mini’s of moody, misty, seascape, landscape and Sierra scenes, so decided to do a larger, 16×20 misty Yosemite scene of Sentinel Rock in Yosemite Valley, CA. After loading up, and heading out for the hour drive home, as soon as I entered the freeway, realized I had left the wet demo painting on top of the car! I pulled over, and it was gone! So, I turned around, went back, and found the painting face down in the middle of El Camino Real, the busy main boulevard. It was in the middle of the lane and didn’t look run over, but one corner was damaged. Here is a recreation of the scene with the painting in the road. 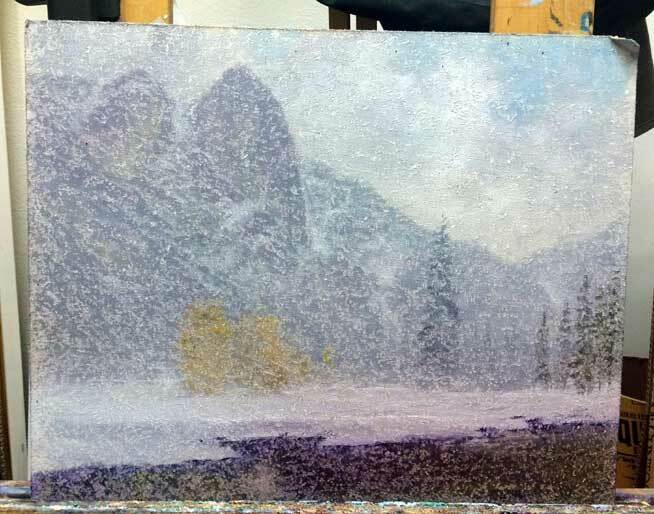 My demo painting was now a snowstorm! 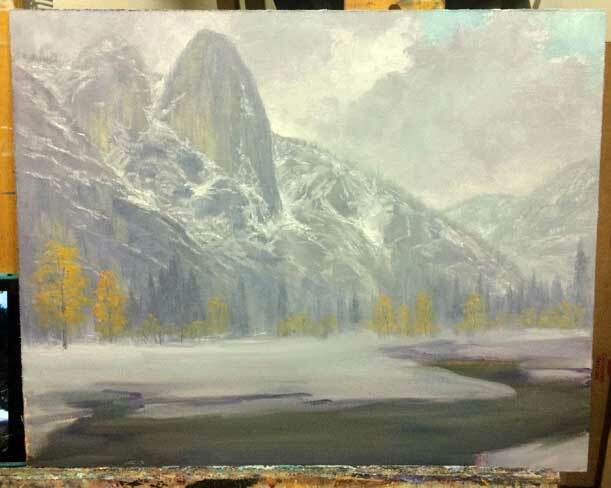 The asphalt had gouged out spots all over the surface and my misty Yosemite painting had turned into a snowstorm! I just accidentally discovered a new way to paint snowstorms! What a great new technique! Just do your painting, then go out and rub it on the road! Asphalt probably works best, but maybe I can try cement streets also! 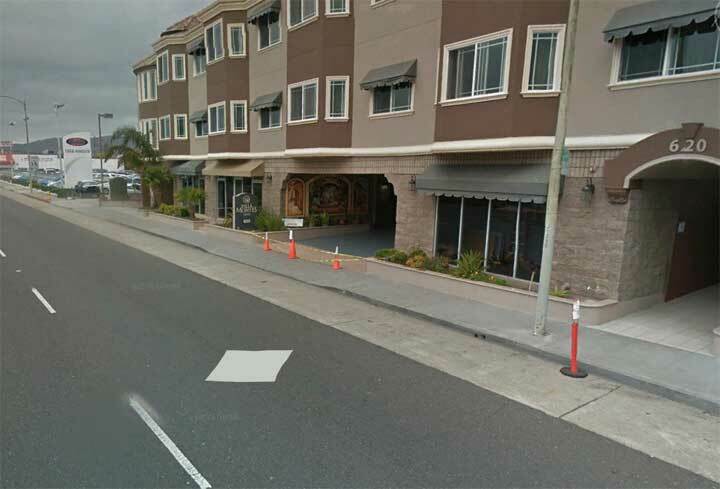 To top it off, a copy of a Neff original, even though half done, is now in the asphalt of San Bruno, albeit a reverse image. Maybe I should charge them?!? All tongue in cheek of course, and I actually don’t recommend you transport paintings this way! The new painting at about the same completion as the demo. So now, what do I do with the original snow storm painting? Any suggestions? BTW, we are planning on producing a short video of the demo as SWA videoed much of it, so stay tuned! 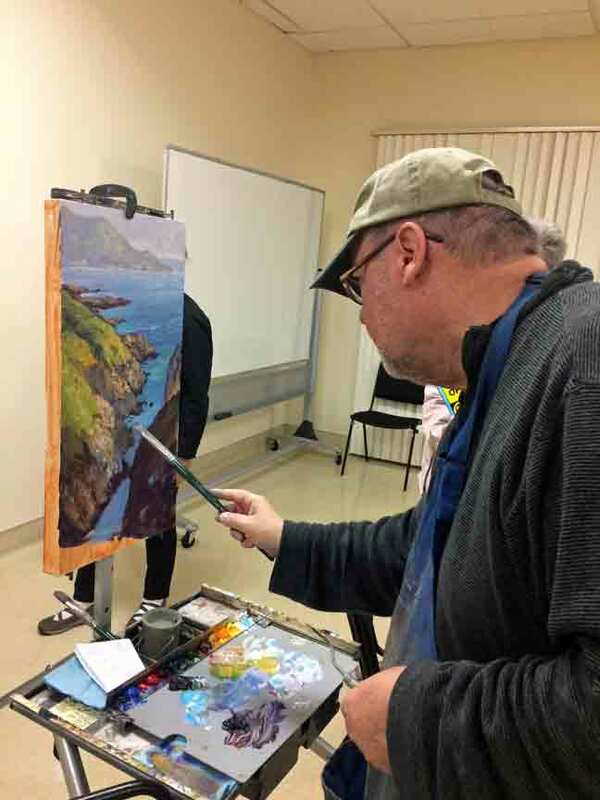 I was invited by a long time painting friend, Steve Wise, to do a demo at the Valle Del Sur Art Guild in Morgan Hill, a town about 10 miles south of San Jose. 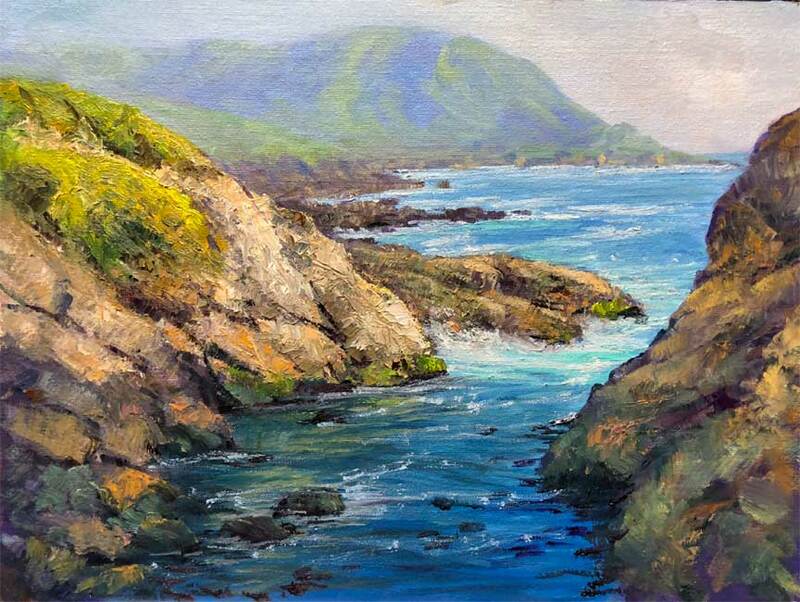 I have painted this area many times including during the Creeks and Rivers of Silicon Valley. Steve asked me to do either a seascape or lake scene, so I chose a seascape. Recently, I have been doing a series of vertical water paintings, so picked a seascape to start for the scene. As usual with these demos, there is not enough time to do a finished painting, but I tried to finish off certain portions to demonstrate various techniques in painting seascapes. It was a small, but lively group, and seemed like questions were coming once a minute as I tried to paint. Steve is quite the art historian, and kept things lively with his historical quips. The painting is the tenth ‘vertical water’ painting series and from the same general area as the fourth in the series found here. The narrow inlet is along the California Coast in Garrapata State Park just south of Carmel, and close to Big Sur. The painting as far as I got during the demo. Thanks, Trudie, for some of the photos! I later spent a few hours in the home studio finishing the piece. Most of you know I paint frequently en plein air, that is outdoors on location. All great landscape painters paint from life, at least occasionally, because you just can’t get true results by just using photos. Photographs skew the values, that is the relative darkness or lightness of a color, making shadows too dark and sunlit areas frequently too light. They can also modify the color to varying degrees. Most good artists can tell when a painting is done strictly from photographs. I don’t often translate or re-paint a studio work directly from a plein air work, but on occasion do just that. Below are a few examples. The first is of an inlet in Lake Tahoe, on the NE part of the lake close to Incline Village, Nevada. I later used the studio piece for the cover of my book “Plein Tahoe”, which you can purchase here. 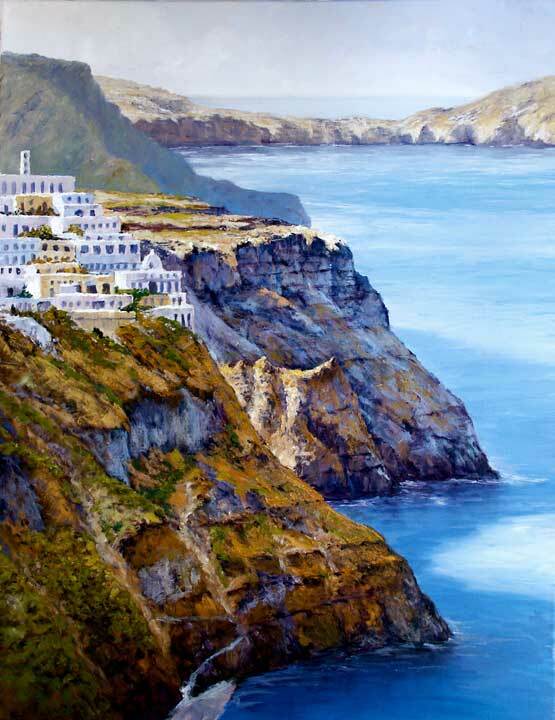 The second example is of Santorini, Greece. As the site of one of the largest volcanic eruptions in recorded history, the Greek island of Santorini is one of the most spectacular in the world. Many scholars believe the eruption spawned the legend of Atlantis. 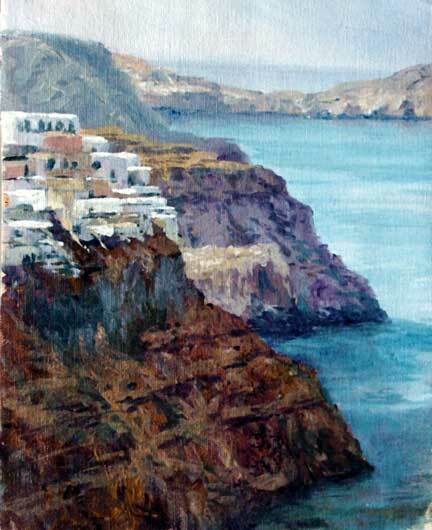 Fira and other towns cling to the cliff overlooking the sea-drowned caldera left behind. 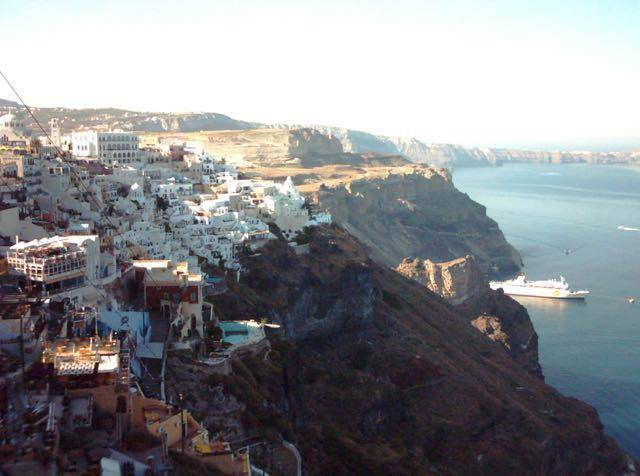 I visited there on a cruise in 2006, and did several studies overlooking Fira and the multicolored cliffs soaring a thousand feet above the caldera. What a spectacular view and setting! Below are pictures of the scene, my small plein air study in acrylic, and a large studio painting in oil I did later. I made very few changes from the original study to the studio piece…it wasn’t necessary to improve on the scene! If you are a landscape artist, be sure to actually visit and paint the landscape in real time! 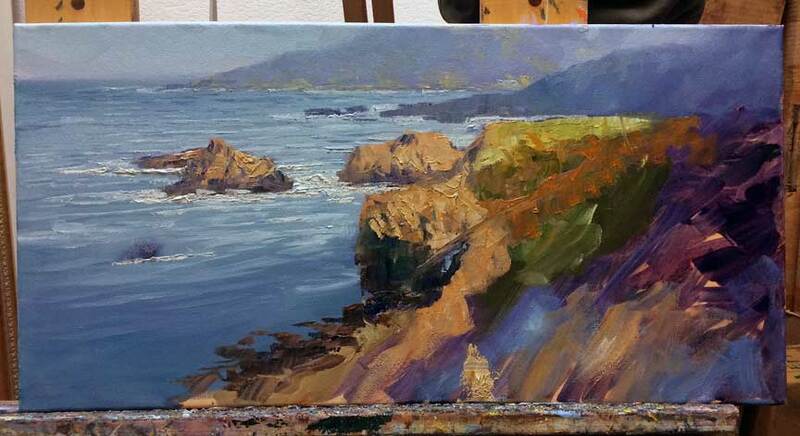 Here is the final version of the painting I started as a demo at the San Leandro Art Association last week. At the time it was less than half done, and I spent another couple hours on it in my studio. I was invited to paint a demo for the San Leandro Art Association last night. I do these association demos about once a year or so. San Leandro is a suburban community on the east shore of San Francisco Bay. It’s home to many corporate businesses such as JanSport, The North Face, and to all you chocolate aficionados, Ghirardelli! San Leandro is normally about an hours drive from my house, but in late afternoon traffic, took over 90 minutes in stop and go traffic. I went a little early, so-as to get a bit of dinner before the meeting. Luke’s Grill jumped out at me as I love Greek and Mediterranean food, so tried it out. I wasn’t disappointed! Here is a photo of the painting where I left it, which is probably only a third done. I’ll try to finish it in the next few days, and post the results back here. 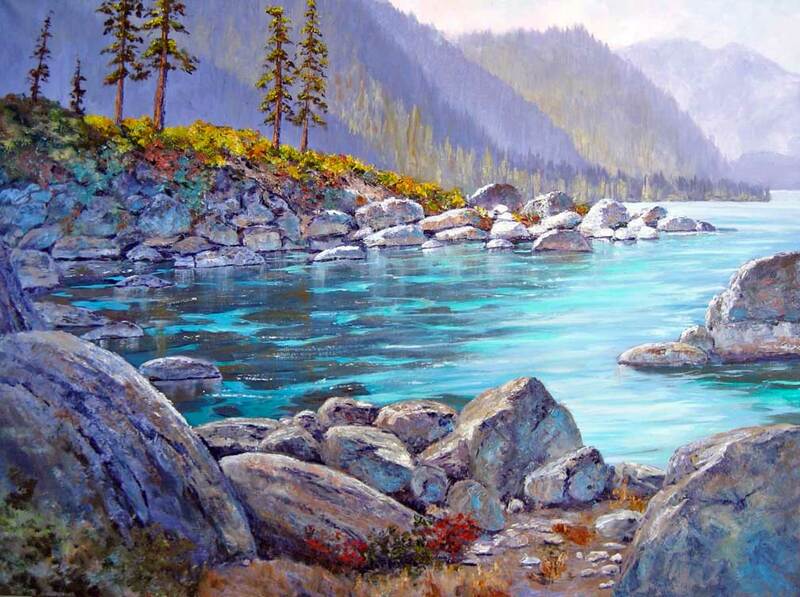 Enjoy this short painting expedition video at Lake Tahoe, California. 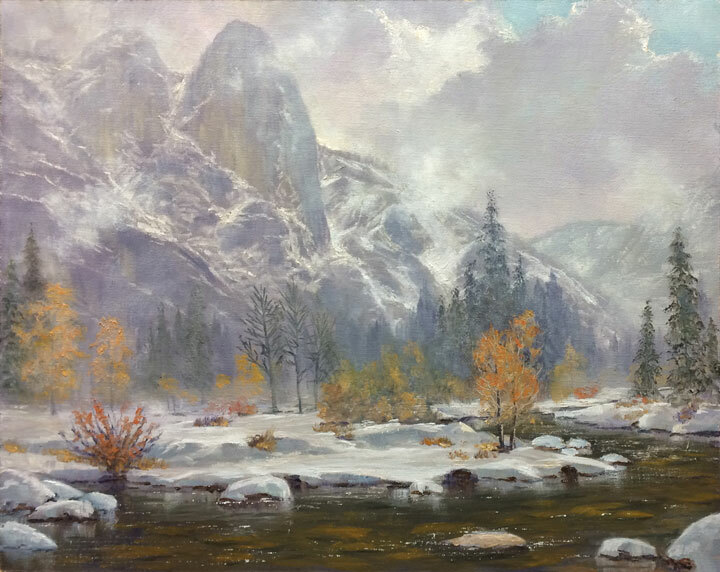 This is a time lapse video of an 8×10 oil painting from the Rubicon Trail in DL Bliss State Park by artist Donald Neff. The time lapse was filmed by a GoPro camera, and other photos taken with an iPhone. 4113 separate photographs were used in making the time lapse portion. Edited with Final Cut Pro on a MacPro cylinder. A masterpiece of nature and the crown jewel of the Sierra Nevada mountain range, Lake Tahoe is one of the most spectacular in the world. From the Native American word meaning “big water”, Tahoe is the second deepest lake in North America, known for the clarity of its water. The pristine deep blue water against the panorama of the surrounding mountains is unequaled in the world. 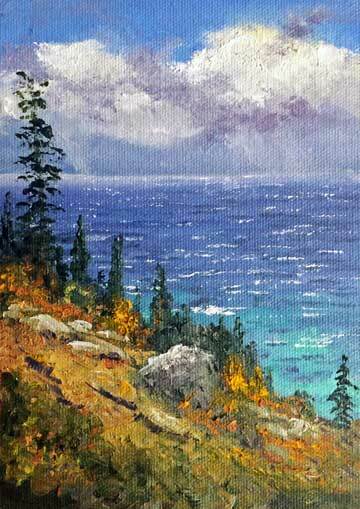 I have been showing at the James-Harold Galleries in Tahoe City for around 15 years, and make regular trips to the area to paint and drop off new paintings. I have even driven my Harley-Davidson Road King there, painted for a number of days, and dropped the newly created works off at the gallery. Hal Slear, the gallery owner, and I have been talking about a little show of miniatures for a number of months, but schedules hadn’t worked out, but finally I just had to do a fall color trip in the area, so here we go! Took off in the morning to drive to the Lake and of course, the worst traffic was just getting out of Silicon Valley! 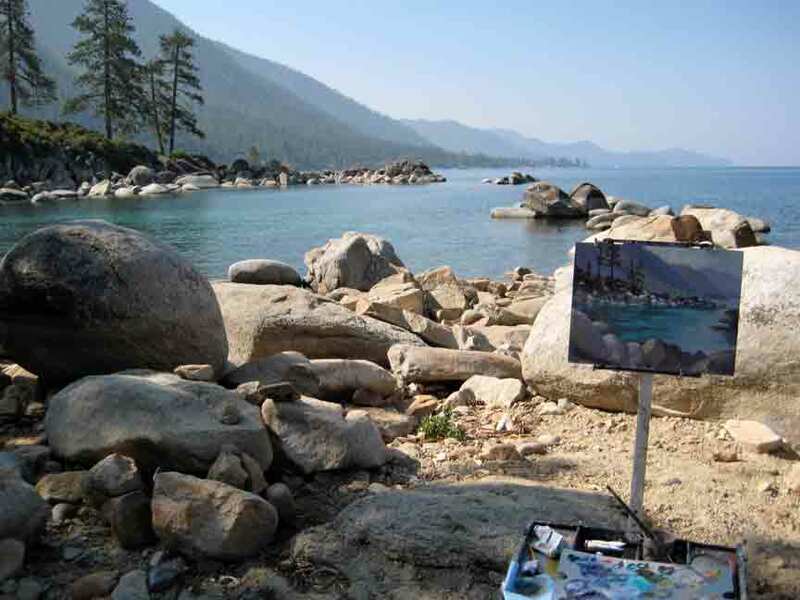 After arriving at the Lake and driving around a bit to check out the fall color, I headed to DL Bliss State Park and one of my favorite places to paint on the lake, along the Rubicon Trail. My plan was to do a time-lapse video of the painting process. I have done these before, most notably “The Painting of TwentyFive: Where Redwoods Thrive” which you can see here. I used the same home made GoPro camera setup, so look for a video soon of the event. Note this isn’t the greatest depiction of the painting as it was taken with my cellphone camera, but hopefully you get the impression. After checking into my motel in South Lake Tahoe, I was so exhausted, it was a very early bedtime for me! I liked a little 5×7 nocturne I did of Lake Tahoe for the show, so decided to do another larger one for my demo in the gallery. I almost finished it between talking to customers and other passers by, and well, just taking my time! Long time friends, Clark & Elaine Hockwald are full time RV-ers and they had been staying at Lake Tahoe for the last 6 months so we arranged to meet at the gallery, and then have an early dinner. I have known Clarke since I was about 11, and Elaine from college days. They have a wonderful weblog about their travels which you can find here. It was their choice for the dinner location, so they picked an excellent nearby place, Christy Hill, which was right on the lake. 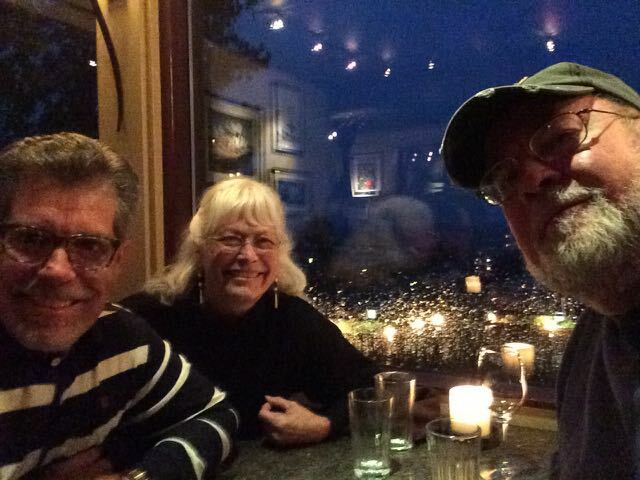 It was a fabulous dinner and we sat for several hours just watching the stormy lake, dining, but mainly telling stories from old times, and a few recent happenings! The Moroccan Lamb I had was just delicious…and I will be looking for a similar recipe! It was a long drive home at night through the pouring rain, but we all made it safely! I was scheduled to be in the gallery from 12-3pm, so drove back through the rain around the lake. I finished yesterdays nocturne painting and had enough time to do another small one, so started a 5×7. Another stormy Tahoe scene was in my mind, so I used a picture I had taken just the day before as a study. With a palette of already mixed colors, everything ‘clicked’, and I knocked it out in no-time. Around 3:30, I headed home in pouring rain, taking over an hour longer than normal. 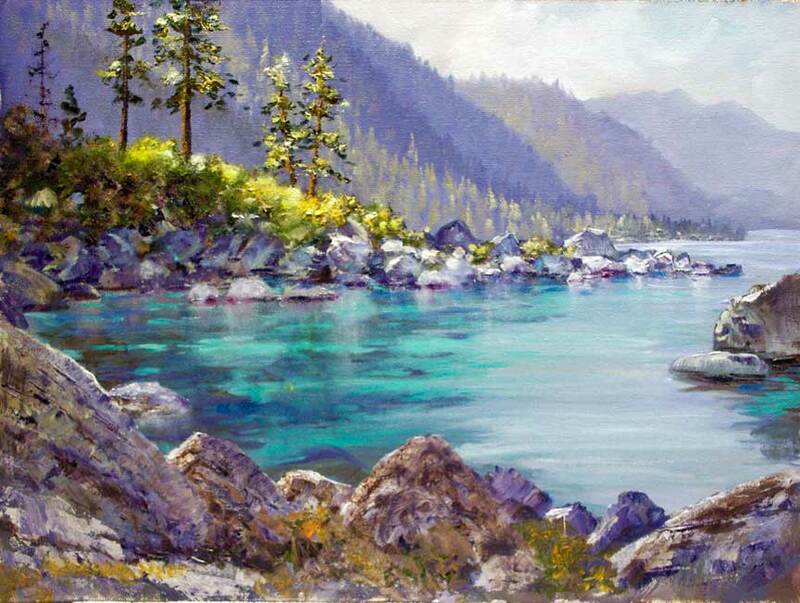 So, if you are in Tahoe the next month or two, stop by and see some new Donald Neff miniatures! All the paintings depicted in this weblog entry are now on sale in the James Harold Gallery. I have priced these to sell over the holiday season, and a number are already gone, so it might be time to add one or two to your collection!